Before setting up your editor, see Project setup on how to configure clj-kondo for your project. TL;DR: this involves creating a .clj-kondo directory in the root of your project. For integrating with Emacs, see flycheck-clj-kondo. This section assumes that you are already using Cursive. 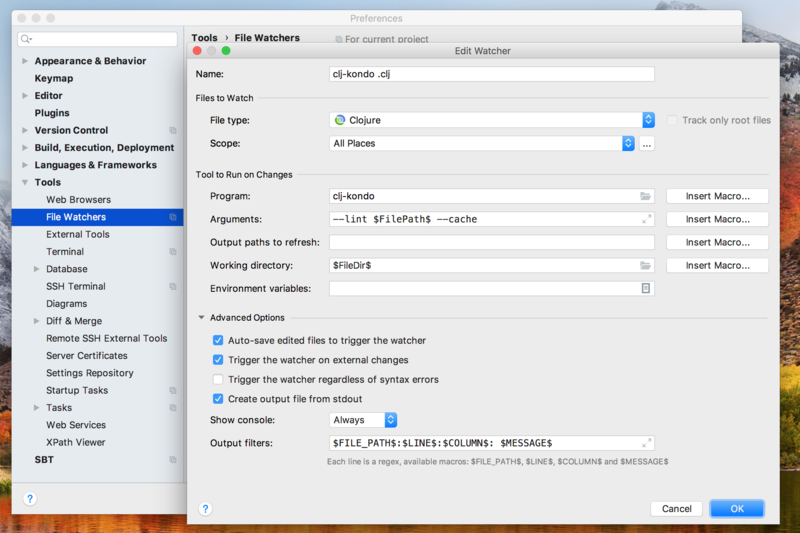 Install the File Watchers plugin. Repeat the below steps for the file types Clojure (.clj), ClojureScript (.cljs) and CLJC (.cljc). Under Preferences / Tools / File Watchers click + and choose the <custom> template. Choose a name. E.g. clj-kondo <filetype> (where <filetype> is one of Clojure, ClojureScript or CLJC). In the File type field, choose the correct filetype. In the Program field, type clj-kondo. In the Arguments field, type --lint $FilePath$ --cache. In the Working directory field, type $FileDir$. In output filters put $FILE_PATH$:$LINE$:$COLUMN$: $MESSAGE$.